Our special redheads in Heaven! our first very special boy "Reny"
our very laid back boy "Monty"
Our first lovely girl "Rhuby"
our very busy girl "Emby"
Our first homebred girl "Kathleen"
Reny was my first Irish. We only wanted a pet, but I got hooked on obedience and later showing. He was such a lovely boy. Typical Irish character with that "look at me" attitude. 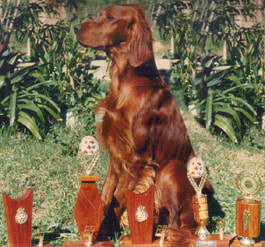 He excelled in the obedience ring and also won many in group awards in the show ring. Reny pictured above with his trophies all won on the one night at an obedience trial in Proserpine. Rhuby was a great girl. She enjoyed her outings, but would have been happy anywhere as long as she was with me. She never excelled in the show ring, but enjoyed her obedience gaining her CD title and later had a healthy litter of 8 puppies. Kaddy was the little girl who stayed home with me when I placed the rest of the litter. She was a lovely girl, but an injury at 9 months took her out of the show ring. She gained her CD title, but was happier sitting in the chair, than competing. What a character! He was a joy to live with and was very at ease with his place in our home. He retired after gaining his CD and Endurance Test Certificate and also many in group awards in the show ring. He loved to "boss" me around when he thought he should be getting a treat! We miss him so much and cherish our memories everyday! Emby came to us as a field trained 2 year old. She never enjoyed the showring but gained her Endurance Test Certificate with ease. She was happierat home on our acreage than anywhere else. Unfortunately she was unableto be a Mum, so she is was desexed and retired and Monty taught her well to"boss" me around when she wanted a treat or some special attention. Emby passed away on 7 August, 2014 at 15 years and 8 months. He was such a great Irish lad! He was a special boy (my present and not my future). He had so much fun in the short time he was with us and brought us so much joy. He had some breed and in group wins and was just starting some formal obedience when he was tragically taken from us in a road accident at 14 months. We still miss him and think of him often.